What do you put your hands through everyday? If you are a "hands on" person like me it's usually a combination of constant washing, rubbing, typing and other daily stresses. It's taken me a while to warm up to the idea of hand creams but I've recently discovered a new favourite that's well worth sharing. It's not that often that an natural/organic beauty brand makes it big mainstream but Evolution of Smooth (EOS for short) created a major stir with their lip balm balls (see review here). 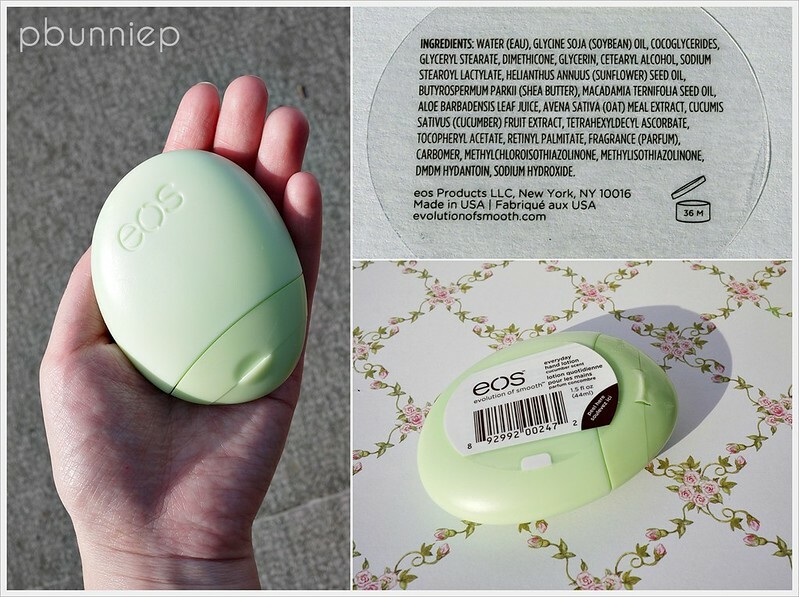 This hand lotion from EOS initially attracted me because of it's unique shape, bright colour and affordable price. Recommended for: Summer time use, those with normal/slightly dry skin. Having being accustomed to rich buttery hand creams I was surprised at the light texture of this product, indeed there is no mistaking this for anything other than a "lotion". It just the right consistency to not run down your hand in a mess but spreads thinly and easily on the skin. 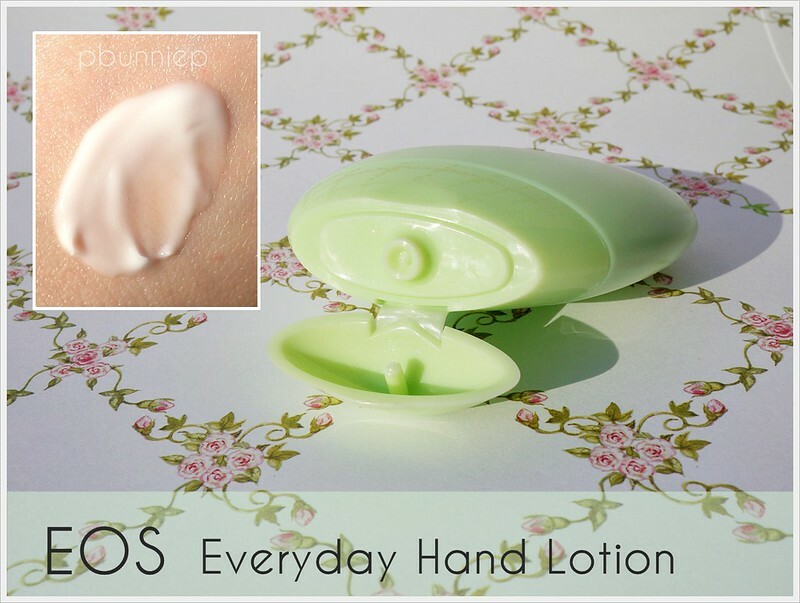 The Everyday Hand Lotion does take 15-30 seconds to fully to absorb into the skin thus I recommend applying just a little at a time to make sure you don't end up with really wet hands (which happened to me the first few times). 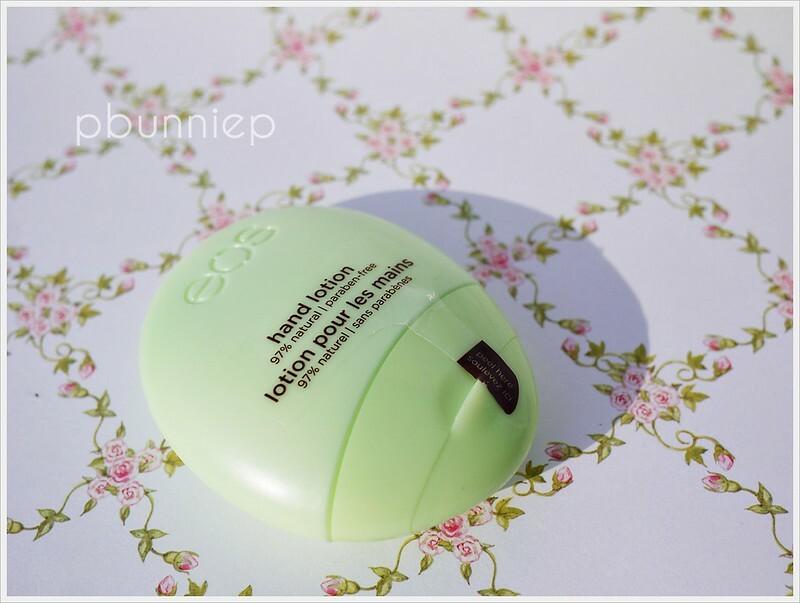 As most lover of EOS will expect, the lotion has a wonderfully sweet melon scent though it can be a tad too perfumey so those with sensitive noses may want to note. For those who love a good scented product, I can say the scent lasts a good hour or two and even when I'm typing I can occasionally catch a whiff of melon. What I love most about this is it's ability to feel so light yet provide just the right amount of moisture (no greasy finger prints on electronics) for my daily needs. My hands feel naturally soft and ready to get back to life's tasks. However I find that this product isn't as intensely moisturizing as say my Crabtree & Evelyn Hand Therapy people with really dry skin will need something stronger. But for me this is just fine, I use the EOS during the day and put on my Hand Therapy before I go to bed. With continued use I feel that my skin looks a little better even on its own so perhaps this lotion has a bit of healing properties as well. *Quick Tip: Sometimes when I'm outside and getting a dry spot, I even apply a dab on my face to soothe my skin and it works just fine. No breakouts or irritation. For those just looking for a simple day to day product to carry around this Everyday Hand lotion by EOS is absolutely perfect. And because of it's natural ingredients I think this will be a hit with mother's looking for a product they can share with their kids when they are out of the house. I'm looking forward to trying out the other scents when I run out of this! What are you loving from EOS? I have just got the EOS lip balm and loving it. Thanks for recommending the hand cream. I will have to go look for it. Does it come in a few flavors/scent? Now I'm super excited to try this. I've been trying to find it but everywhere online is just too expensive for a hand cream. Thanks for the review! Yeah, not bad stuff, but for lip balm I prefer something like Buddha Balm. EOS just doesn't go on or stay on the lips. Good review. Thanks.